We are reckoned as one of the most prominent waterproof cement paint manufacturers and suppliers in India. The Cement Paint is in powdered form that mainly constitute of white cement and micro minerals. The cement paint is widely used for providing elegant finish to the exterior as well as interior walls of the building. The cement floor paint is suitable for concrete block, bricks & asbestos sheet etc. as these are highly durable and resistive to various extreme conditions. These are available in 31 ready shades to ease the customers to place orders as per their requisites. 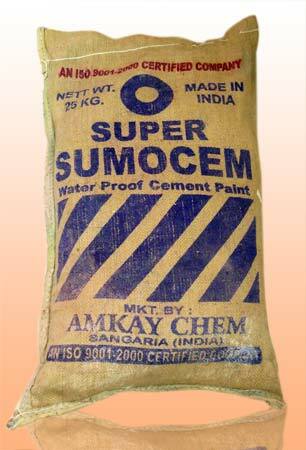 These are packed in Hessian bitumen jute bag that are of 5 kg and 25 kg. Base White Cement & Micro Minerals. Packing 25 kg. & 5 kg. Hessian Bitumen jute Beg. As Exterior Wall Finish as well as interior Wall finish. Can be apply on Cement plaster Stone masonery, Concrate Block, Bricks & Asbestos sheet. Applied By Brush & Spray. Coverage Capacity 10 to 15 sq.mt./Kg. Approx depend on Surface & Shade. Shades Available in 31 Ready Shades. Pot Life > 1.5 Hrs.